I tried this recipe of mutton yakhni pulao and it was so yummy but instead of chicken I tried it with mutton and I also add little yellow food color in end to give it an attractive look. I hope that you all will try it and do give the comments on picture I took. In a muslin cloth tie the coriander and fennel seeds together to make a spice bag. Heat ghee in a pot and add that spice bag in it. Add garlic ginger paste and mix it. Now add onion and cook it for 1 minute. Onion should be in light brown color. Add whole spices in it and after few seconds add mutton and fry it well while stirring it. Now add tomatoes, green chilies, red chili flakes and salt in it. Add water according to your rice. Cook, it covered for 5-10 minutes or till mutton is tender. Take the spice bag out and discard it. Now add drained rice in it and mix it and cook it till the rice are 3/4 cooked and water is dried. Now put a lid on it and put it on dum for 10-15 minutes on very low flame. Serve it with salad and raita. It is a full meal by itself. Note: You can take any meat instead of chicken. You can also use oil instead of ghee. The dish look very pleasant and refreshing from its picture. Thanks for a very interesting and quick to make recipe. Please let me know much water should be added after soaked rice is mixed with chicken / mutton. 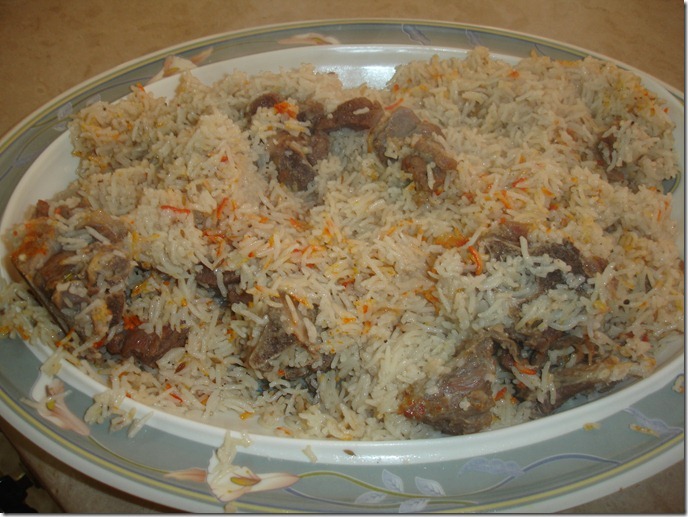 it depends on quality of rice, the ratio which i use for basmati rice is of 1 glass of rice and water is 1.5 glass. Yakhni Pulaoo mai Tomatoos kahan say agye BEHAN kuch bhi daal kar dhakan laga doo Jo bhi ban jaye marzi say naam rakh doo..!! Thanks for a good recipe. Nice but can you tell me which kind of rice to use in it …? ?